New venue: A concept drawing of the Science Gallery, part of the Carlton Connect innovation precinct. Plans to create a dynamic new venue for science and art collaboration at the University of Melbourne are well under way. 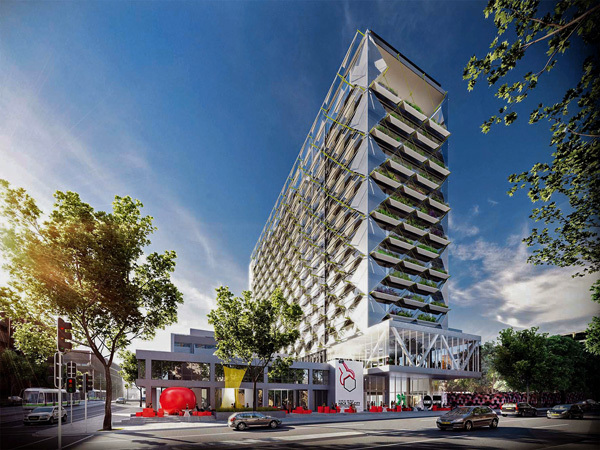 Science Gallery Melbourne will open in 2018 at the corner of Swanston and Grattan Streets, and act as the “front door” to the University’s new innovation precinct, Carlton Connect. Science Gallery is an award winning international initiative pioneered by Trinity College Dublin that delivers a dynamic new model for engaging those aged 15 to 25 with science. Once established, Science Gallery Melbourne will be part of the Global Science Gallery Network – a network of eight Science Gallery locations developed in partnership with leading universities in urban centres. Vice-Chancellor Professor Glyn Davis AC says establishing a Science Gallery in Melbourne is a key pillar of the University’s engagement strategy. “Engagement is the expression of who we are and what we value as a public-spirited University,” he says. Professor Karen Day, Dean of Science, says the new venue will contribute to the vibrant and rapidly expanding innovation “ecosystem” at the University of Melbourne. “Seventy-five per cent of the fastest-growing occupations require STEM subjects, where Australia has worrying gaps in these skills from primary to tertiary education levels. A Science Gallery Melbourne would be a powerful addition towards building Australia’s engagement and literacy in STEM subjects and in providing a creative bridge between art and science,” she says. Michael John Gorman, CEO of Science Gallery International, says Melbourne was a natural choice for the next Science Gallery. “For Science Gallery International, Melbourne was the obvious choice for the location of the first and only planned Australian Science Gallery due to its combination of a world-class university partner in the University of Melbourne, and its vibrant scientific and artistic communities – a city designed for creative collisions between science and art,” he says. Rose Hiscock, former Director of the Museum of Applied Arts and Sciences, which includes the Powerhouse Museum in Sydney, has been appointed the inaugural Director of Science Gallery Melbourne.